Fundraising for crises, like veteran and military suicide or the ongoing slaughter in Aleppo, routinely falls short of that raised for less pressing causes. And it’s not that people don’t care about veteran and military suicides, or the thousands wounded, dead, or dying in Aleppo. Because they do. Or at least most do. The issue is that, because veteran and military suicide and other crises are blatantly worthy causes, many won’t mobilize to action, whether that’s a donation or volunteering their time, because they think such crises are already drawing ample support. It’s almost as though the worthiness of these causes is undermining support for them. However, this phenomenon is nothing new and has been well-documented in the field of psychology and even international affairs. 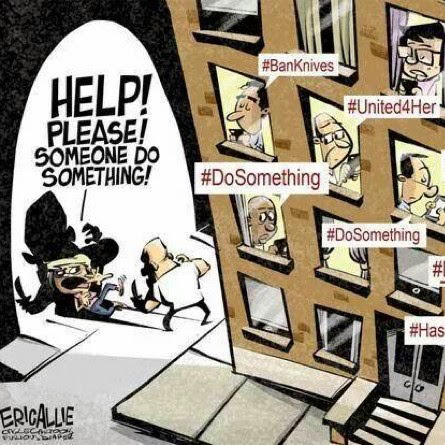 The most famous instance is the case of the bystander effect is Kitty Genovese who was brutally stabbed to death on the streets of New York City in front of 37 witnesses who did nothing. When asked why they didn’t come to the aid of Genovese, each said it was because they thought someone else would help her. The Genovese story, widely circulated in a spectacular article in the New York Times, prompted psychological researchers to study why the witnesses in the case did not come to the aid of Ms. Genovese. The research yielded what today is a well-known theory in the field of psychology: the bystander effect (also known as the diffusion of responsibility). Early research on the topic indicated that, as the number of people available to help increases, the less likely it is for any one person to step forward to help a victim, a seemingly counterintuitive finding that has since been supported by more recent research. In short, when observing a crisis in a crowded area, people don’t help because they assume someone else already is. Switching gears, international relations theory also explains why so few provide tangible support for causes like veteran and military suicide. When faced with an existential threat, weaker states, especially those in strategically or resource-rich areas, often rely on their more powerful allies to quash the threat. In effect, they freeload off their powerful allies who they judge have a vested interest—usually an economic or military interest—in the security of their country. In the case of veteran suicide, the public has justifiably, but unwisely, put its faith in the VA—and the government as a whole—to provide adequate care for our veterans. In other words, when faced with a significant crisis like veteran suicide, people don’t help because they assume they can count on the government to solve the problem. After three months of fundraising with Objective Zero, we have become familiar with the bystander effect or, as we like to call it, the Facebook effect. People are quick to ‘like’ and share posts to show support for a cause, which is helpful in raising awareness, but are more reluctant to take the next step to donate or volunteer, likely because they believe viewers of their re-post will donate. And, hey, we’re not pointing fingers. After all, we are guilty of this, too. We all are. It has only become apparent to us now, as we struggle to bring to reality what is so painfully worthy a cause as Objective Zero. The truth is, the ease with which social media sites like Facebook and Twitter allow us to broadcast content is deceiving. While social media is a powerful tool that can be used for good, it also gives us a false sense that, by simply broadcasting content, we’re doing our part, that we’re making a difference. But we need to do more. While American service-members have been at war non-stop for the past 15 years, the average American citizen has not. Globalization and the proliferation of advanced telecommunications technologies have brought news to the masses on demand. This has caused the average American citizen to become a bystander to both our wars, and their aftermath. With over 40,000 non-profit organizations serving military and veteran causes, it is evident that the space for charity giving to veteran organizations is crowded and hugely competitive. Also, with the enormous resources of the VA and the availability of Veterans Crisis Line it’s easy to see why many don’t take action despite being fully aware of the scope of the veteran suicide epidemic. The reality is that veterans of America’s wars do, in fact, need your help. The efforts of the Veterans Administration and the Veterans Crisis Line, while well intentioned and staffed by good people, are encumbered by bureaucratic processes that have repeatedly failed to deliver for many veterans, especially those in crisis. Worse, rather than think differently about the problem and potential solutions, VA leaders have instead chosen to pour more money and resources into efforts and policies that have already failed to provide consistent and meaningful results. Although social media sites like Facebook, Twitter, and Instagram are powerful tools for raising awareness, there is literally no one else picking up the tab. If we really care about our veterans and military members and think the suicide crisis they’re facing is unacceptable, that more needs to be done, we, as a society, need to step up. We can’t afford to pass the buck.